Ben Hill Griffin Stadium (in full Steve Spurrier-Florida Field at Ben Hill Griffin Stadium), popularly known as "The Swamp", is the football stadium for the University of Florida's football team which is located on its Gainesville, Florida campus. The stadium was built in 1930 with a capacity of about 22,000, and has been expanded, renovated, and improved many times over the ensuing decades. 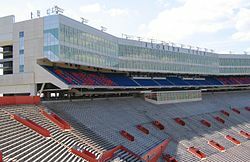 Most of the football coach and administrative offices and the football team's training facilities have been under the south and west stands of Florida Field since the 1960s. In 2016, the University of Florida Athletic Association announced plans to build a $60 million stand-alone football facility which is scheduled to open in 2019. Ben Hill Griffin Stadium is the largest football stadium in Florida, the 12th largest stadium in American college football, and the 18th largest stadium in the world, as measured by its official seating capacity of 88,548 – though, it has often held over 90,000 for Florida's home football games. 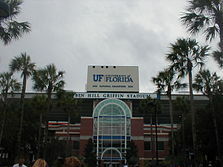 The stadium is on the northern edge of the University of Florida campus near the center of Gainesville. The stadium and its approach are bordered by West University Avenue on the north side, Gale Lemerand Drive (previously North–South Drive) on the west, and Stadium Road on the south. Just east of the stadium is the University of Florida Campus Historic District, which is the oldest portion of the campus and includes the Murphree Area student residence complex, the Florida Gymnasium, and Ustler Hall. Just west of the stadium across Gale Lemerand Drive is the Stephen C. O'Connell Center, which is the home arena for the Florida Gators men's basketball, women's basketball, gymnastics, volleyball, and swimming and diving teams. Just beyond the O'Connell Center are the football team's practice facilities and Alfred A. McKethan Stadium, home field of the Florida Gators baseball team. Prior to the 2015 Season, a new indoor practice facility was added just north of the baseball field and east of the grass practice fields. The name of the facility was simply "Florida Field" from its opening in 1930 until 1989, when the university renamed the stadium in honor of citrus magnate Ben Hill Griffin, Jr., an alumnus and major benefactor of the university and its sports programs. However, the playing surface remained "Florida Field", and the facility's full name was "Ben Hill Griffin Stadium at Florida Field" from 1990 until 2016. On September 3, 2016, the playing surface was renamed in honor of former Florida quarterback and head coach Steve Spurrier. As UF athletic director Jeremy Foley explained, "Coach Spurrier did more than win a Heisman Trophy, a national championship, and a bunch of games. Coach Spurrier changed the culture of Florida Athletics." As a result, the facility's official name is now "Steve Spurrier-Florida Field at Ben Hill Griffin Stadium". The facility may be best known as simply "The Swamp", a nickname which was coined by Spurrier in 1992. As he explained at the time, "A swamp is where Gators live. We feel comfortable there, but we hope our opponents feel tentative. A swamp is hot and sticky and can be dangerous. We feel like it's an appropriate nickname for our stadium." 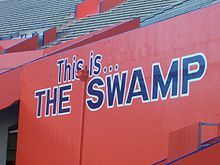 Both the nickname and the "only Gators get out alive" tagline added later by UF's sports marketing department quickly became popular and have been commonly used ever since. From the establishment of the University of Florida in Gainesville in 1906 until the end of the 1910-1911 academic year, the university's football, baseball, and track teams competed at a municipal baseball park near the center of Gainesville and known simply as "The Baseball Park" or "The Ballpark". The university built an on-campus field in the summer of 1911. A grove of pine trees along University Avenue was cleared and leveled, a single bank of low wooden bleachers were built, and University Athletic Field opened in time for the 1911 football season. Larger bleachers were installed by 1915, when the facility was rechristened "Fleming Field" in honor of former Florida governor Francis P. Fleming. Even with the additional seating, Fleming Field was small (maximum capacity about 5000), so Florida played many "home" games against top opponents at larger venues across the state, usually Fairfield Stadium in Jacksonville or Plant Field in Tampa. Florida Football first earned national prominence in the 1920s, prompting incoming university president John J. Tigert to begin a drive to construct a new and larger stadium upon his arrival in 1928. With state funding unavailable at the cusp of the Great Depression, the semi-independent University of Florida Athletic Association was organized to raise funds and oversee the project. To expedite construction, Tigert and ten supporters of Florida's athletic program took out personal loans to cover the $118,000 required to build the planned 22,000-seat football stadium. Construction began on April 16, 1930 and immediately faced serious engineering and geotechnical obstacles related to natural groundwater and drainage. The stadium was built in a shallow ravine, with the lower thirty-two rows of the east, west, and north stands below the level of the surrounding land. When excavation reached the water table, water began to pour into the construction site from the north end, miring men, mules, and mule-drawn equipment in the resulting mud. The drainage challenge was ultimately resolved by the installation of massive underground culverts leading to Graham Pond, two blocks south of the stadium site. Problems solved, the construction team of eighty laborers and mules completed Florida Field in time for the November 8, 1930 homecoming game against Alabama, the dominant Southern Conference team of the day. Florida Field was rededicated in 1934 to the memory of Florida servicemen who died in World War I, and a plaque was placed on the outside wall behind the old north end zone as a memorial. Over the years, Florida Field has undergone many renovations, almost always adding more seats. The original stadium—the lower half of the current facility—seated 21,769. The stadium was first expanded in 1949–1950 with the addition of 11,200 permanent seats to the west stands, which, together with temporary bleachers, almost doubled capacity to over 40,000. 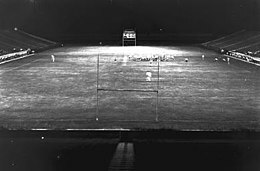 Lights were also added at the time, and the 1950 season kicked off with Florida Field's first night game, a 7-3 win over The Citadel. In 1965–1966, 10,000 more permanent seats were added to the east stands and larger bleachers were installed in the south endzone, bringing capacity to over 60,000. Construction of the double-deck south endzone in 1982 and the 1991 addition of the "Sunshine Seats" upper deck to the north endzone combined to bowl in the stadium and raise capacity to over 80,000. After a 2003 project greatly expanded club seating and added many luxury boxes, the Swamp had grown to become the largest football stadium in the state of Florida and the second largest sports facility overall behind only the Daytona International Speedway. The official seating capacity is 88,548, although the actual attendance regularly exceeds 90,000. A view of the Daktronics south end zone video board, measuring 137 feet by 30 feet. Following the Florida's 2008 BCS Championship season, large Daktronics HD-16 video boards were installed atop the upper deck of both endzones. The screen in the south endzone is 30 feet x 137 ft while the one in the north endzone is 25 feet by 75 feet. These screens are used to display statistics, replays, advertisements, and other things. After the 2011 season, an extensive renovation of the 1950s-era concourse under the west stands improved restrooms, lighting, concessions, and crowd circulation patterns and added flat-screen displays for fan viewing. In September 2016, the school's University Athletic Association Board proposed a $100 million facilities upgrade, to include a $60 million stand-alone football facility for players. The stand-alone facility would include an updated locker room, 3-D hologram training environment, strength and conditioning center, hydrotherapy space, team meeting rooms, coaching offices and nutrition bar. The facility will be built by the engineering firm HOK. When the new facility is completed, some of the redundant space in Ben Hill Griffin Stadium will be repurposed for other uses. Before the 2017 season, improvements were made to the south end zone that includes a new LED ribbon video board for use to display college football scores, advertisements, messages, and other things. The playing surface of Florida Field has also changed over the years. It was natural grass until 1971, when Astroturf was installed and nicknamed "Doug's Rug" for then-coach Doug Dickey. The original artificial surface was replaced with an updated version in 1980, and it remained until 1990, when newly hired coach Steve Spurrier insisted it be removed and replaced with natural grass to help prevent player injury. In June 2012, the playing surface was completely torn out down to the substrate to improve drainage and install a Bermuda grass hybrid developed with assistance from the University of Florida's Turfgrass Science Team to better resist drought, disease, and damage. Florida has played the vast majority of their home contests at Florida Field since it opened in 1930. 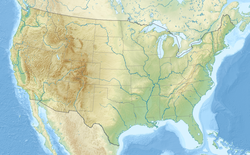 The most notable exception is the annual Florida-Georgia game, which has been held in Jacksonville since 1933 with the two teams alternating being the official home team. The only seasons in which UF and UGA did not meet in Jacksonville were 1994 and 1995, when the old Gator Bowl was being rebuilt as the venue now known as EverBank Field for the NFL's expansion Jacksonville Jaguars and the contest was held at Florida Field and Georgia's Sanford Stadium, respectively. In years past, Florida would occasionally schedule a home game in Jacksonville, Tampa, or (less frequently) Miami and Orlando. But besides the annual meeting with Georgia, the Gators have not played a regular season home contest anywhere besides Florida Field since September 1980, when they defeated the California Golden Bears in old Tampa Stadium. Not coincidentally, this game was played the season prior to Florida Field's south endzone expansion, which made it the largest football stadium in Florida. The Swamp has acquired a reputation for being a difficult place for opposing teams to play, and has regularly been ranked at or near the top of lists of top home field advantages and/or best game day experiences in college football. One of the major reasons is the stadium's design. Originally built in a shallow sinkhole, the playing surface is below ground level. Expansions have enclosed the playing area on all sides with steep stands, and the fans are within a few feet of the action. This traps crowd noise inside the stadium, which results in sound levels on the field which have been measured at 115 decibels—just short of the threshold of pain. The enclosed playing area also enhances the effects of Gainesville's warm and humid fall climate. Game-day temperatures at field level have been known to exceed 100 °F (37 °C), creating a swamp-like atmosphere. (This was the impetus for a University of Florida researcher, Robert Cade, to develop Gatorade as a way to combat dehydration.) Furthermore, during hot and sunny day games, Florida's sideline (on the stadium's west side) is in the shade provided by the press box, while the visiting team's sideline (on the stadium's east side) is exposed to the sun. A "blue out" for Tennessee. Florida fans are loyal (having sold out every home contest from 1979 until 2011) and loud, thus creating a tremendous home field advantage for the Gators. The size and exuberance of the home crowds, when combined with the stadium's close-in design of the seats, concentrates the fan noise at field level, making the Swamp one of the loudest stadiums in America. Combined, these factors create an intimidating environment which can rattle and disrupt opposing teams, making it difficult to hear playcalls and execute assignments. Florida Field has been repeatedly ranked by various publications as being the toughest stadium in which to play for opposing teams. Florida's performance at home illustrates this effect. In a twenty-year span beginning in 1990 (when the north endzone expansion was completed), Florida posted a 113–13 overall home record, which was the best in the nation during that period. They were particularly dominant under Coach Steve Spurrier. They went undefeated at home from the time Spurrier arrived in 1990 until 1994, and lost only three SEC home games during Spurrier's 12 years in Gainesville. Commemorated on the south end zone's facade are the years of each of the team's Southeastern Conference championships and its 1996, 2006 and 2008 National Championships. Also included are tributes to the school's three Heisman Trophy winners, Steve Spurrier, Danny Wuerffel, and Tim Tebow. On the north end zone facade, the Ring of Honor commemorates the greatest players and coaches in Gator football history. The members are Tim Tebow, Wilber Marshall, Steve Spurrier, Danny Wuerffel, Emmitt Smith, and Jack Youngblood. In April 2011, life-size bronze statues of Heisman Trophy winners Steve Spurrier, Danny Wuerffel, and Tim Tebow were dedicated outside the west side of the stadium along Gale Lemerand Drive. Entertainment on game days includes the "Pride of the Sunshine", the University of Florida's marching band. The Pride was the first marching band in Florida. For many years, it was recognized for its very large bass drum, known as the "Biggest Boom in Dixie." The band plays on the field for pregame and halftime and also plays an instrumental version of the University of Florida fight song, "The Orange and Blue", after every Gator score. Albert and Alberta, one of the few costumed mascot couples in major college sports, have been attending games together since 1984. Albert debuted first, in 1970. Before the costumed mascots, a live alligator (in a cage) named Albert was often displayed in the sideline. Right before the team enters the field, a short intro is played on the large video screens. A group of (real) alligators are shown gathering in a murky swamp while ominous music plays. Then the camera zooms into the gaping jaws of a large alligator while a deep voice intones "The Swamp . . . Only Gators get out alive!" as the football team takes the field. Jim Finch, the public address announcer at the stadium from 1966 through 2001, was known for his famously long "Heeeeeeeeeeeeeere come the Gators!" call delivered in powerful baritone as the Gators ran onto Florida Field before each game, and for his succinct and even-handed style of announcing the plays during the game. Finch died in 2002, but an audio recording of his distinctive entrance call has been used on occasion, with the current PA announcer replicating Finch's call for all other games. George Edmondson (a.k.a. "Mr. Two Bits"), wearing his trademark yellow oxford shirt, blue seersucker trousers, orange-and-blue tie, and black-and-white saddle shoes, traveled around the stands for almost 60 years leading fans in the old "Two Bits" cheer ("Two bits! Four bits! Six bits! A dollar! All for the Gators, stand up and holler!"). Edmondson began the tradition in 1949 and "retired" to become a regular fan after his fiftieth season in 1998. However, he couldn't stay in his seat and continued to lead the cheer during pre-game festivities and (occasionally) in the stands during games. On November 22, 2008, at the last home game of the season, Mr. Two Bits was again honored with a retirement ceremony. At the end of the third quarter, the Pride of the Sunshine Band plays "We are the Boys from old Florida" while the fans sway back and forth by rows and sing along. The University of Florida was an all-male school from 1905 to 1947, and singing the song at football games has been a tradition since at least the 1930s. Following the death of musician and Gainesville native Tom Petty in October 2017, University of Florida Athletic Director Scott Stricklin instituted a new tradition. Immediately after the crowd sings We Are the Boys of Old Florida at the end of the 3rd quarter, Petty's hit song "I Won't Back Down" is played to encourage the team to push through and finish the game. Fans in the stadium sing along, with many holding aloft their cell phones to fill the stands with lights. Florida Fans join in on shout-outs and chants such as "ORANGE" (yelled by students, mostly in the East and South stands) and "BLUE" (yelled by alumni, mostly in the West and North stands). During the pre-game, this cheer is led by Richard Johnston (also known as "Mike Man" or "Mr. Orange and Blue"), a former cheerleader who has been the pre-game emcee since 1984. For many years, the ship's bell of the battleship USS Florida (BB-30) was mounted at stadium's North end zone wall, to be rung by a nearby fan after a Florida victory. After the North end zone expansion in 1991, the bell was moved to the north end zone concourse for display but was later removed during a minor renovation. When Steve Spurrier became the Gators' head football coach in 1990, he revived the tradition of fans and players together singing the University of Florida Alma Mater after the conclusion of home football games. Upon arriving in 2005, Urban Meyer added the singing of "The Orange and Blue", the Florida fight song, after home victories. The Florida Football team plays only six or seven home games per season. At most other times, Steve Spurrier-Florida Field at Ben Hill Griffin Stadium is open for students to jog around the concourse, run stadium steps, or just sit in the stands, although the actual playing surface is off limits to prevent turf damage. The facility only occasionally hosts special events. Steve Spurrier-Florida Field at Ben Hill Griffin Stadium has hosted the Florida High school football championships on over a dozen occasions. Florida Field has twice served as a temporary home for college bowl games when other Florida stadiums were undergoing renovations. In 1973, Florida Field hosted the Tangerine Bowl, which pitted the hometown Gators against the Miami Redskins while Orlando's Citrus Bowl was being rebuilt. The 1994 Gator Bowl between the Virginia Tech Hokies and Tennessee Volunteers was held in the Swamp while Jacksonville Municipal Stadium was being rebuilt for the National Football League's expansion Jacksonville Jaguars. Florida Field was once a busy concert venue, with artists such as Bob Dylan, Joan Baez, Elton John, The Eagles, and Jimmy Buffett among the performers who held concerts at the stadium. However, these events have been much less common in recent decades. Wary of damage to the turf or the facility, the university has chosen to reserve the stadium for sporting events and hold concerts in the nearby O'Connell Center arena. The Swamp's last concert (other than performances during Gator Growl) featured The Rolling Stones on November 27, 1994. The Swamp was the long-time home of Gator Growl, a student-produced show and pep rally held the Friday night before the annual homecoming football game, until 2013. Originally a simple affair, Gator Growl has grown tremendously over the years. The program usually includes the introduction of the seniors on the football team by the head coach, live student skits, video skits (often with celebrity cameo appearances), a musical act, and a headlining comedian. Past headliners include such luminaries as Robin Williams, Dennis Miller, Jerry Seinfeld, Dave Chappelle, Bill Cosby, Billy Crystal, Dane Cook, Paula Poundstone, Wayne Brady, Rodney Dangerfield, George Burns, Bob Hope, and Sister Hazel. ^ a b c d e f Gatorzone.com, Facilities, Ben Hill Griffin Stadium at Florida Field. Retrieved April 9, 2010. ^ Brew, Tom (November 28, 2015). "Florida Gators set Ben Hill Griffin attendance record in showdown with Seminoles". saturdaydownsouth.com. Retrieved November 29, 2015. ^ "IFAS Second Annual Turfgrass Field Day" (PDF). ^ Antonya English, "100 things about 100 years of Gator football Archived 2016-09-04 at the Wayback Machine", St. Petersburg Times (August 27, 2006). Retrieved September 29, 2011. ^ "UF picks firm to design stand-alone football facility". gatorsports.com. February 22, 2017. ^ Low, Chris (September 4, 2016). "Swamp Sweet Swamp: Steve Spurrier is back home at Florida". ESPN. Retrieved September 4, 2016. ^ a b "Sports: 100 things about 100 years of Gator football". Archived from the original on September 4, 2016. ^ Harry, Chris. "25 Years Ago: The 'Swamp' is born". floridagators.com. ^ Carlson, Norm (September 14, 2009). "Gator talk: History lesson". Gatorzone.com. Retrieved July 19, 2013. ^ Norm Carlson, University of Florida Football Vault: The History of the Florida Gators, Whitman Publishing, LLC, Atlanta, Georgia, p. 38 (2007). ^ Julian M. Pleasants, Gator Tales: An Oral History of the University of Florida, University of Florida, Gainesville, Florida, pp. 31–32 (2006). ^ a b c d e Carlson, University of Florida Football Vault, p. 41. ^ "Tigert understood the significance of sports". ^ Carlson, University of Florida Football Vault, p. 42. ^ "University of Florida makes homecoming plans". St. Petersburg Times. November 3, 1930. Retrieved July 11, 2013. ^ Carlson, University of Florida Football Vault, p. 78. ^ "Stadium Addition at U. of Florida Wins Platinum Rating for Sustainability – Buildings & Grounds – The Chronicle of Higher Education". ^ "New video boards for Ben Hill Griffin Stadium". ^ "CPPI Partners with UAA for West Concourse Renovation at Ben Hill Griffin Stadium". 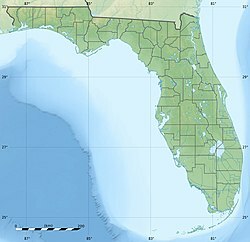 ^ "Florida unveils $100 million facility upgrades initiative". AllGatorArmy.com. September 16, 2016. Retrieved February 23, 2017. ^ "New football facility". FloridaGators.com. February 22, 2017. Retrieved February 23, 2017. ^ "Gator Astroturf goes on sale". St. Petersburg Times. June 4, 1980. Retrieved July 11, 2013. ^ "Florida Field Undergoes a Facelift as New Playing Surface is Installed". ^ College Football Data Warehouse, Florida-Georgia Archived July 7, 2015, at the Wayback Machine. Retrieved December 16, 2009. ^ "The Nation's Best: Eighth Annual Herbie Awards". August 26, 2008. ^ "Sporting News - NFL - NCAA - NBA - MLB - NASCAR - UFC - WWE". ^ "The Best Atmosphere In College Football Belongs To... :: One thing's for sure, it belongs to the SEC". ^ a b "Florida Gators". ^ "Mel Kiper - For scenery, check out Michie Stadium - ESPN.com". ^ "SI.com – SI On Campus – The Vent – Thursday September 22, 2005 9:13PM". ^ "Home - Sports News, Scores, Schedules, Videos and Fantasy Games - FOX Sports". ^ "Gators unveil Tebow, Spurrier, Wuerffel statues". April 9, 2011. ^ Eric Ritter (November 1, 2006). "Florida Gators Swamp entrance" – via YouTube. ^ "Sports: Highs and Lows". Stpetersburgtimes.com. Retrieved April 8, 2010. ^ a b c d e Dooley, Pat (August 9, 2001). "Florida Gator Traditions: Good and Bad". Gainesville Sun. pp. 1C, 6C. Retrieved July 16, 2013. ^ "Sports: Dad there for Zook era's start". Stpetersburgtimes.com. Retrieved April 8, 2010. ^ "Mr. Two-Bits gets his due as he looks back". Gainesville.com. Retrieved April 8, 2010. ^ Andreu, Robbie (October 9, 2017). "Petty song a new Florida Field tradition". The Gainesville Sun. Retrieved January 15, 2018. ^ "Gainesville.com - The Gainesville Sun - Gainesville, Fla". ^ "University of Florida Gator Growl 2007: Nation of Champions Presented by Verizon Wireless - Home".